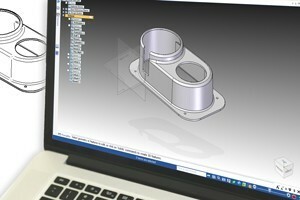 Computer Aided Design, or CAD, is often used to provide the accuracy required for many of today’s product requirements. 3D Modeling can provide a virtual image of the final part design for our clients and our engineering department to review. This type of review can be priceless when trying to determine the final fit, form and function of a part. 2D drawings provide a vast amount of information about a typical part and also provide detailed specifications to ensure that the final product will meet the customers’ expectations. At Arrowhead, we strive to provide you, our customer, with the highest level of CAD services available in our industry. We provide a variety of different CAD services that will help us build a high-quality part you would expect from a leader in the custom fiberglass and custom thermoforming industries. We will work closely with you to convert your data, generate new data or just recreate new data from your existing information. This helps us to ensure that we provide a quality finished product.